The investigations of the Mission were run between the 28th of July and the 22nd of August. The efforts were concentrated on two different issues. Firstly, in Trench XIII the Mission documented an early-Christian basilica. This investigation will help in the conservation project prepared by the Ukrainian partners. In trench XXVII, on the other hand, the Mission launched archaeological excavations. Polish Participants: Alfred Twardecki – head of the Polish Mission, Eliza Walczak, Inga Głuszek, Wiesław Małkowski, Bartosz Wojciechowski, Dawid Święch, Artur Buszek , Marcin Matera. Ukrainian Participants: Viktor Zin'ko – head of the „Bosporan City Tyritake” project, Aleksiey Zin'ko, Aleksiey Nizhnyakov, Anatoliy Hanko, Mykola Lutsenko, Vadim Starinski, Aleksander Kobets, Oleg Skrylov, Ivan Chyzhnak, Sergey Yurev, Slava Epishko, Aleksander Chervotkin, Sergey Smitskoy, Vadim Anochow, Sergey Cherikov, Denis Bieylin. Volunteers from the Charkov University: Anna Lushan, Viacheslav Vodka, Svietlana Ilchenko, Yaroslava Yakovleva, Rima Svinchuk, Yekaterina Lazankova, Ilona Fedorchuk, Yelena Lysenko. Russian Participants (students from Nizhnyi Novgorod): Anna Proksenova, Maria Karavashkina, Natalia Karavashkina, Andrey Boronin, Aleksander Turkin, Anna Soroka, Valery Soroka, Anna Kuznetsova. The map presented below depicts the territory of the ancient polis of Tyritake and areas which were recently subjected to extensive archaeological investigation. Figure 1 shows an overall plan of Tyritake. Trench XIII – site of an early Christian basilica, investigated by the Polish Archaeological Mission „Tyritake” (measurements, documentation, drawings, plans). Trench XXVI – area investigated by the Ukrainian archaeological mission directed by dr. hab. Viktor Zin'ko. Trench XXVIII – new trench investigated by the Ukrainian archaeological mission directed by dr. hab. Viktor Zin'ko. Clearing the site of an early Christian basilica was rendered exceedingly difficult by the presence of duds. The plan of the basilica was thus only partially drawn; further investigations will be made in the next season. Already now, however, it was possible to establish that the edifice, unearthed in 1938, has been significantly damaged since the time of its discovery. This conclusion undoubtedly provides another argument in favour of intensifying conservation and reconstruction works. 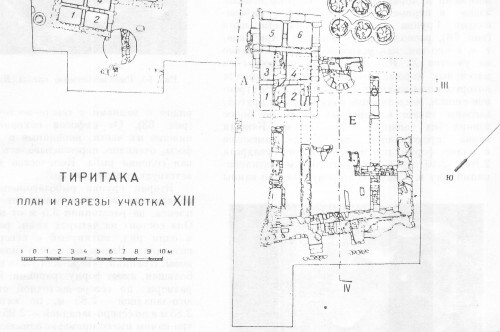 Figures 2 and 3: plan by Gaidukevich (MIA 25, 1955) and a plan drawn on 2008 by the Archaeological Mission „Tyritake”. In trench XXVII, the team has begun by clearing the area and running a geophysical analysis of the trench and the adjacent areas. On the 29th and 30th of July an electrical resistivity test was run, using the ADA 5R device produced by Elmes. Two „twin probe” sets with different electrode intervals (0,5m and 1m) were put to use. A grid of squares measuring 20 by 20 m was set on the surface of Trench XXVII and its vicinity for running geophysical analyses. The squares were named A (the one furthest to the west), B and C (the one furthest to the east, adjacent to the boundary of trench XXVI). When the probe with a 0,5m interval was used, measurements were made each 0,5m, along 1m lines. When using the 1m interval probe, measurements were made using a 1 by 1m grid (in a 20 by 20m square). Measurements made with an 0,5m interval probe were conducted in a 400 m2 (20 by 20 m) square. These measurements did not allow drawing any unequivocal conclusion, apart from establishing that large amounts of debris are located just below the surface. This observation was later confirmed by excavations. Measurements made with a 1m interval probe were conducted in 800 m2 (40 by 20m) square. The results of this investigation allowed drawing a conclusion that a rectangular edifice is located in square A.
Magnetometric investigations followed. They were executed with a fluxgate-type magnetometer FM 256 made by Geoscan Research. The resolution was 0,1 nT per 0,1 second. The investigations were conducted in a 0,5 by 0,25m grid (measurements lines were spaced by 0,5m; measurements were made every 0,25m on each line) within 20 by 20m squares. In order to improve the quality of the investigation, the measurements were made using the so-called parallel method (while registering, the device was moved only in one direction) and after completing each measurement within a single square, the positioning of the probes was corrected. The entire surface subjected to the investigation measured1200 m2; 9600 measurements were taken. 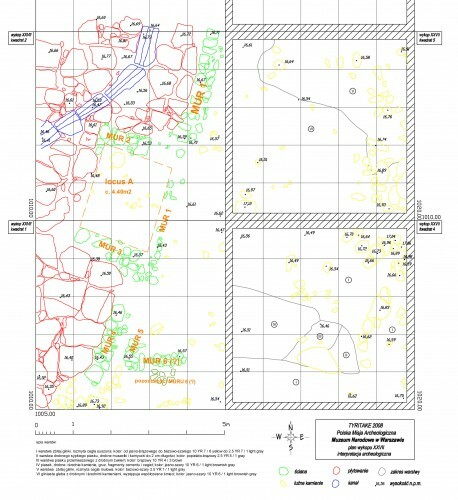 The initial compilation of the data was made with the Geoplot 3.0 (Geoscan Reserach) program, maps were drawn using Surfer 8.0 (Golden Software) program. Magnetic measurements allowed concluding that most of the investigated area within squares A, B and C is filled with anomalies characterized by high amplitudes of values, which can be identified with metal objects. In the eastern part of square B and western part of square C four parallel, light lines were clearly visible. These anomalies are oriented roughly along the N-S axis and might, but not unequivocally, point to existence of ancient walls. Different anomalies, in the shape of short, light lines, oriented perpendicularly along the E-W axis, might be interpreted as short walls added to the already existing walls. These investigations, the results of which were briefly presented above, allowed deciding as to where open the trench. After discussing the issue with the Ukrainian partners, it was decided to open the trench in the area of 6 standard squares, measuring 5 by 5m, over the presumed rectangular construction recognized during the geophysical investigation. It was thought that it might be a part of the city's defensive system. These extensive works, even though they lasted a few days and delayed the commencement of the proper excavations, were absolutely essential, as they enabled establishing a precise database necessary for documenting the results of further investigations. On the basis of geodesic measurements, a grid consisting of 6 squares, arranged in two rows, was established. Within this grid trench XXVII, measuring 10 by 15 m, was opened. The numeration of squares begins with the one furthest towards the south-east (nr 1) and continues towards north until it reaches the limit of the trench. The squares of the second, „eastern” row are numerated in the same way. Figure 4 depicts the first stage of the works undertaken by the Mission, which was finished by the 2nd of August. After removing the uppermost layer in all 6 squares, it has been decided to open a test trench in square 2. The results of the levelling of the square oscillated between 17, 27 and 17,12m. Down to the level of 17m the exploration of square 2 was limited to removing strongly mixed layers dating to the 20th c. The material finds from this layer were constituted by contemporary rubbish (glass, bricks, fragments of shoes, tins, etc.) mixed with some objects from the 19th c. as well as from antiquity. After reaching the level of 17,00 m, first stone slabs were unearthed. It was established that they were elements of street paving. The paved surface was cut by a ditch leading from the north towards the south-west and entering the western section of square 2. Under the paved area in square 2 remains of two walls, wall 1 and 2, were discovered. One of the stone slabs from the street bore an incised alpha, written in majuscule. Finds of this kind are rare in the Bosporan Kingdom area. After unearthing the fragments of a stone construction in square 2, it was decided to go down to the same level in squares 1 and 3. Even before the exploration was commenced, a layer of ancient pottery sherds was identified on the surface of the south-east corner of square 1. After further research (results from square 4) it was concluded that this material probably belonged to a spoil heap, which was created during the investigation of the neighbouring trench XXV. Street paving slabs in square 1 were unearthed at the depth of 16.50 m in the north-western part of the square and at about 16.35 m in the south-west part. 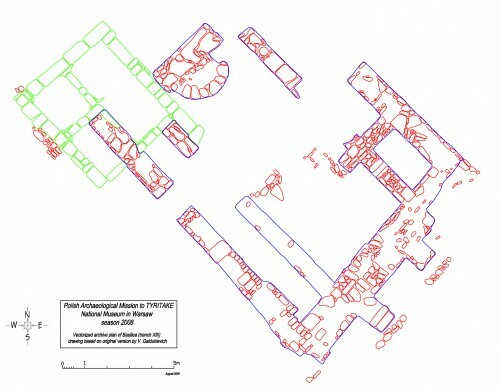 After cleaning the surface of the excavated area in square 1, remains of walls were identified (wall 3, 4 and 6). In the south-eastern corner of square 1, at the depth of ca. 17.30 m, a new layer, consisting of soil ranging in colour from light brown to yellow, was discovered. This layer was probably created by the erosion of sun-dried bricks. At the depth of 17m, this layer was visible at the extent of 2m. It can be thus concluded that remains of a structure, made of sun-dried bricks erected on a stone socle, was discovered. The exploration of square 3 was concluded at the level of 16, 57 – 16, 44 m, approximately 0,10 m below the level of paving and ca. 0,05 m below the last remaining layer of the stone bedding of the canal. The entire surface of the square was constituted by a trench opened in the 20th c. and no ancient structures were found here. It is most likely that their remains were destroyed during levelling works executed whilst laying the local road which passes next to the trench. No traces of ancient structures were found in square 4 either. The entire surface of the square, down to the level of approximately 17.15m was constituted by a mixture of soil, rubble, rubbish and ancient material. Below this level a layer of greyish-yellowish brown soil, characterized by a clay-like texture, was discovered in the south-western corner. This layer was probably formed by the remains of dampened sun-dried bricks. At the top of this layer, layer of ashes, approximately 0,10m, was identified. It might be a trace of an ancient fire. The initial hypothesis is that the first, mixed layer is formed by remains of an old spoil heap, formed by archaeological investigations. This conclusion is based on finding of a billon-stater of Reskuporis VI, 3-kopeyka coin issued by the Soviet Union in 1938, tip of a bullet from a machine gun, dating to the period of World War Two, and 15-kopeyka Soviet coin from 1950 in the investigated layer. It is probable that the process of removing soil mixed with rubble and rubbish was synchronous with removing the material from the neighbouring trench XXV – this would explain the relatively homogenous character of the layer. In square 5, by the end of the exploration, the same layer consisting of eroded sun-dried bricks which was identified in the south-western corner of square 4 and the south-east corner of square 1, was unearthed in the north-eastern corner. The remaining part of the trench was filled with the same soil-rubble material as in square 4. This mixed layer covered most of the investigated square for the almost entire period of exploration. This is shown not only by stratigraphy, but also by the nature of the bulk ceramic material. The ceramic material from square 5 consists of amphorae sherds, fragments of hand-made pottery and vessels, ranging in date from the turn of the archaic and classical period to the 7th - 8th c. AD. In square 6 the investigation was limited to removing the uppermost layer. This was due to a lack of time as well as a well-based belief that the area of this sector is very likely to be destroyed, just like square 3, by the modern trench, opened probably whilst constructing the road and parking leading from the Ordzhonikidze street towards trench XXVI. In summary, one can conclude that the 2008 campaign resulted in unearthing interesting remains of stone constructions, dating probably to the 5th -6th c. AD, i.e. the last phase of existence of the settlement of Tyritake. The unearthed remains are: stone paving slabs (probably remains of a street), a sewage channel, and remains of walls, initially classified into 6 parts. Within this complex one can provisionally identify a single, rectangular room of about 40 m2, however this observations needs to be corroborated by further investigations. 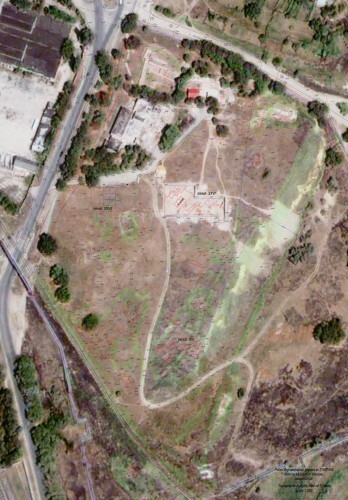 Archaeological investigations were conducted over an area of 150m2, and the depth of ca. 80-90 cm was reached. Due to the mixed character of the investigated layers, only small amounts of bulk material and small finds were found. From amongst the latter, one should mention the two bronze coins dated to the 4th c. BC. Given the character of stratigraphy, described above, these finds cannot be used for dating. However, one can expect that material allowing establishing a chronological framework will be found below the level of paving slabs, when undisturbed cultural layers will be excavated. The results of the 2008 campaign provide a great starting point for continuing the investigation in 2009. During the first season non-invasive geophysical and geodesic works were conducted and the most recent layer, with a preserved cultural layer dating to the Byzantine era and well-preserved remains of interesting stone structures. Figure 5 shows the results of the investigations and their provisional interpretation.